Here, you can download and read many Scouting and Scout-related books. In addition to official Boy Scouts of America publications, including the Boy Scout Handbook and Fieldbook, many of these are important historical official Scouting books. Many of these books came from “The Dump,” an internet resource for Scouters. The user is reminded that many of the handbooks, manuals, articles and stories presented here were written very long ago. Consequently, they may occasionally use some terms or express sentiments which were in current use at the time of their writing, regardless of what we may think of them at the beginning of the 21st century. For reasons of historical accuracy the texts have been preserved in their original form. If you find any of them offensive, please delete the files from your system. Some of the skills, requirements and terms in these materials may differ from present day practices. They are preserved and offered with the intention of providing a historical perspective for today’s Scouting leaders. Please use them in conjunction with a current copy of your handbook or your Scouting association’s guidelines and policies when planning your Scouting programs. All books found here are provided under the Fair Use guidelines of the United States Copyright Law. To check availability of books in Troop 501’s physical lending library, check Library link in the Troop 501 Advancement System. Boy Scout Handbook – Boy Scouts of America The 12th (and current) Edition of the Boy Scout Handbook. This edition adds new, updated information, links to resources on the web at www.boyscouthandbook.org, and returns to many classic Scout Skills, including text from “Green Bar” Bill Harcort. Please keep in mind that this book is over 400 pages long. As Troop 501 provides each new Scout that crosses over into the troop a copy of the current Boy Scout Handbook, it is highly recommended that you DO NOT PRINT this file. However, you may wish to print certain sections, checklists, tracking sheets, etc. by Sir Robert Baden-Powell The definitive manual for Scouts. This is the book that started Scouting. Complete with original illustrations by B-P. 1954 “Brotherhood Edition”. The book consists of introductions for Scouters, 26 “Campfire Yarns” for Scouts and a summary. Boy Scout Handbook – Boy Scouts of America The 1911 First Edition. This is the ORIGINAL Boy Scout Handbook of the Boy Scouts of America. It is a great resource. Merit Badges are the second main area of the Boy Scout advancement program. Unlike ranks, there is a degree of choice in the merit badge program. A sub-group of merit badges are known as Eagle required merit badges. To earn Eagle Scout, most of these badges must be earned although some are “either/or” badges. The remainder of the badges help with earning ranks as well as Eagle Palms after the Eagle Scout award has been earned. A Scout is required to complete a Merit Badge Application (an automated version is available on the Troop 501 Advancement System, and a PDF version can be found, here, on the Troop 501 website, on the Documents page) prior to beginning work on a merit badge. These books are essential to the support of an active Scouting program. 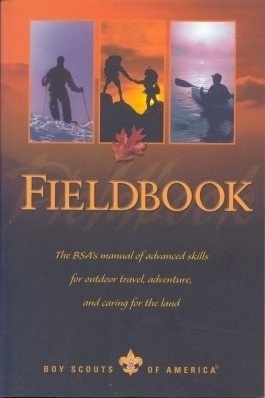 The 2004, 4th Edition (current, as of the date of this writing) of the BSA Fieldbook. Based on experiences of millions of Scouts and leaders, this book holds essential information for every outdoor enthusiast. A comprehensive reference, this handbook includes sections on trekking, preparation and adventures, appreciating our environment, and more. The Fieldbook is available for download, by clicking the title to the left. However, it IS NOT recommended that you print the book, as it is 579 pages long. If you wish to have a printed copy, it is HIGHLY RECOMMENDED that you purchase a copy for $9.99 at your local Scout Shop, or online at www.scoutstuff.org. It is available, spiral bound, for slightly more. The printed edition has 614 pages (including index) of detailed “How To” knowledge of the outdoors, conservation, and the backcountry. Throughout this edition of Fieldbook, an arrow icon alerts you to further information – including books, organizations, websites, periodicals, and audiovisual materials – available online. The Fieldbook website, www.bsafieldbook.org, can be used in tandem with this book to help you make the most of your outdoor experiences. Troop Program Resources – Boy Scouts of America The Troop Program Resources book contains a variety of The Scoutmaster’s Minute(s), many games, a plethora of ceremonies, ideas for Interfaith Worship Services, a glossary of Scouting terms, Pearls of Wisdom—quotes from Baden-Powell, information about the founders of the BSA, forms, and Scouting clip art for use in troop meetings and activities. 2012 Requirements – Boy Scouts of America The official requirements for all BSA ranks, badges, and other awards, effective January 1, 2012. Guide to Advancement – Boy Scouts of America, 2013 While the 2012 Requirements book outlines the requirements for various BSA awards and ranks, this publication details how the advancement program is to be administered. Guide to Safe Scouting – Boy Scouts of America March, 2013 (online version, at is updated quarterly). The purpose of the Guide to Safe Scouting is to prepare members of the Boy Scouts of America to conduct Scouting activities in a safe and prudent manner. The policies and guidelines have been established because of the real need to protect members from known hazards that have been identified through 100 years of experience. Limitations on certain activities should not be viewed as stumbling blocks; rather, policies and guidelines are best described as stepping-stones toward safe and enjoyable adventures. All participants in official Scouting activities should become familiar with the Guide to Safe Scouting and be aware of state or local government regulations that supersede Boy Scouts of America policies and guidelines. The Guide to Safe Scouting provides an overview of Scouting policies and procedures rather than comprehensive, standalone documentation. For some items, the policy statements are complete. Unit leaders are expected to review the additional reference material cited prior to conducting such activities, and a copy of the Guide to Safe Scouting must be present at all activities. (A copy of this PDF on your smartphone meets this requirement). Guide to Leader Training – Boy Scouts of America This new guide outlines the basic responsibilities for volunteer leader training committees and the methods of BSA volunteer training. To be sure that information is up-to-date, the guide does not include the forms and other resources that are more easily available, and more current, via Scouting.org. The training pages of Scouting.org will help you find the current resources, forms, and courses available—as well as the latest in BSA training. These books, while most are older even than our faithful Scoutmaster, contain a wealth of information important for all Scouts to know, and skills that each would do well to possess. The Scouts’ How-To-Do-It Book A short book with loads of hints on general Scouting knowledge – 1953. Standing Camps 1949 – Manual of Camping for Scout Troops. Week-end Camps & Hikes 1935 book, by C. H. Young. A Handbook for Patrol Leaders. The First Class Hike A short pamphlet from Boy Scouts Assoc Canada on the 1st Class Hike. Scout Mapping 1963 book, by P. W. Blandford. The Scout Self Taught Series #3. The Scout and His Axe John Thurman’s booklet on the axe. Pioneering A compendium of Scout Pioneering resources. The Scouts’ Book of Gadgets and Dodges 1946 – A treasure house of ideas and sugggestions which the active outdoor Scout will find a real help. Pioneering Projects 1961 book, by John Thurman. Pioneering Principles 1962 book, by John Thurman. Progressive Pioneering 1964 book, by John Thurman. Fun With Ropes and Spars 1956 book, by John Thurman. Rope Splicing 1953 book, by P. W. Blandford. Everything you want to know about Rope Splicing. Ropework Booklet This booklet gives nice photographs, illustrations, and instructions for tying a number of knots. Winter Scouting The 1950 Boy Scouts Association of Canada manual on Winter Scouting. Recreative Training for Scouts By Colonel R.B. Campbell (1949). Tumbling for Scouts The 1931 book regarding one of the lost aspects of physical development in Scouts. Saving Life 1910 book, by a “B.P.” Scout. Vol. III. The Boy Scout’s Library. These books are full of Scouting games, leadership games, team-building games, as well as games just for fun. These books feature both indoor and outdoor games, games for all ages, and all group sizes. Scouting Games by Sir Robert Baden-Powell A collection of games written by the Founder specifically for boys. Boy Scout Games BSA – 1958. Gilcraft Book of Games A 1928 compendium of over 350 popular Scout and Cub games. You will be amazed how many already are the favorite of your troop and how many will become the “new” favorites. Outdoor Games for Scouts The 1952 Gilcraft book on Outdoor Games for Scouts. Sixty Indoor Games for Scouts The 1932 book on the most popular indoor games for Scouts. These books contain campfire yarns and stories, or serve as a guide in putting on an organized campfire program. The Boy Scout’s Book of Campfire Stories 1921 book of campfire stories – published by BSA. Woodsmoke at Twilight A collection of short stories suitable for Cubs and younger Scouts. Inspirational as well as slightly entertaining, they aim to give practical examples in prose of the Scouting Spirit and the qualities of a Scout or Cub as well as application of their Promises in their lives. It is decidedly dated (1955-1965), but nevertheless still useful. Yarns for Boy Scouts Yarns told round the campfire – by B-P – 1910. The Scout Book of Stunts and Ideas Jack Blunt’s 1935 book on Scouting stunts and ideas. More Stunts and Ideas Jack Blunt’s 1938 book on more Scouting stunts and ideas. More Concert Items for Scouts and Cubs For playacting – by H.L. Davies (1932). The books in this section are for Patrol Leaders, Senior Patrol Leaders, Assistant Patrol Leaders and Assistant Senior Patrol Leaders, and adult troop leadership. Patrol Leader Handbook – Boy Scouts of America This is the 2002 Fourth (and current) Edition of the Patrol Leader Handbook published by the BSA. Patrol and Troop Leadership – Boy Scouts of America This excellent guide to patrol leadership, published for Scouts in 1972, is still very useful even though it is a bit dated, and remains arguably the best guide for youth leadership ever published by the BSA. Patrol Leaders’ Handbook John Thurman’s 1950 The Patrol Leaders’ Handbook – Full of photos, drawings, charts and yarns to help your Patrol Leader be a Leader. Golden Arrow Training Handbook Training Manual for Patrol Leaders 1960 first edition. The Patrol System and Letters to a Patrol Leader The 1917 book by Capt. the Honourable Roland Philipps regarding the most important topic in the Scout section – the Patrol. Working the Patrol System 1943 – A short booklet on how to make the Patrol System work. How to Run a Patrol A Handbook for Scoutmasters & Patrol Leaders – 1939. How to Run a Troop Ernest Young’s book with 39 preplanned Troop meetings – 1923. Running a Senior Scout Troop Melville Balsillie’s 1964 book on Senior Scouting. Ideas for Scout Troops Jack Cox’s 1961 book on the Scout program, and what to do with Scouts. How to Run a Boy Scout Camporee A short booklet by BSAC – 1959. Scoutmaster Handbook – Boy Scouts of America 1998 (9th/current edition). This resource serves as the Scoutmaster’s primary guide and contains a helpful section about advancement, including the merit badge program. by Sir Robert Baden-Powell The fundamental manual for Scout Leaders. Describes the purpose and methods of Scouting. Complete with original illustrations. The Scouter’s Five Minutes 1953 collection, published at the same time as the Scouters Series. Troop Committee Guidebook – Boy Scouts of America This is the 2000 printing of the 1998 (and current) edition. Troop Scouters’ Handbook Boy Scouts of Canada’s comprehensive 1958 reference book for the Troop Scouter. These books are of historical and general Scouting interest. They contain a look into the history of Scouting, and provide a window into the past, while also giving us a foundation for our own Scouting activities and units. Be Ye Perfect 1950 book, by E. J. Rowland. Talks on the Scout Law and Promise. The Scout’s Reciter and Elocutionary Instructor 1922 – How and what to recite. Things Scouts Can Do 1960 book, edited by F. Hadyn Dimmock. A Book Of Scouting Adventures Jack Blunt’s 1935 book on Scouting adventures. Mixed Grill Jack Blunt’s 1949 book on Scouting activities. At one time, in the US (in as late as the Sixth Edition of the Boy Scout Handbook), and to this day, in many Scouting organizations, a Scout must pass tests in order to advance from one rank to another. In some of those organizations, the Scout must also re-test prior to advancing to the next rank, or on some sort of a schedule. While “Testing” is not conducted in the BSA, the books below contain a wealth of information that will aid the Scout in advancing from Scout through First Class Scout. First Steps in Scouting 1940 – Complete Instruction in Tenderpad and Second Class Tests. Starting to Scout 1944 Edition of Tenderfoot and Second Class Tests. How to Get Your Second Class in 20 Weeks 1961 book, by R. Hazelwood. The Scout Self Taught Series #1. The Gateway To All The Scout Tests 1950 book, by A. V. Brook and W. Hamblin. Gilcraft’s First Class Book Gilcraft’s 1945 First Class Book. First Class Tests and How to Pass Them 1953 – Boy Scouts Association. These books have information that can be very useful to all Scouts. The Boy Scout & Wolf Cub Proficiency Badge Reference Book A small booklet from BSAC (1940). Tenderfoot to Queen’s Scout 1955 edition of the basic Canadian Scout manual. Rovering was the original “Older Boy” program. There are many ideas that can borrowed from Rovering. Rover Scouts What They Are and What They Do.